Journalism: Principles and Practice is the must-have guide to everything you need to know about how journalism works. This new edition is fully updated to cover the new essentials: social media, the impact of Twitter, and the need for an ethical approach. This new edition retains its innovative two-column structure, stylishly blending theory and practice. As relevant to the newsroom as the seminar room, it is the one book you will need to take you through your degree and into your career as a journalist. PART ONE: WHAT IS JOURNALISM? Chapter 3: What is news? Chapter 4: Where does news come from? Chapter 5: ‘The best obtainable version of the truth’: journalists as objective reporters? PART THREE: WHAT NOW FOR JOURNALISM? A holistic assessment of what journalism is all about, with plenty of enterprising interpretations of our trade - a word I prefer to 'profession'. I never met a more 'unprofessional' breed than that of my fellow hacks. This book will, I hope, lead our successors both to question and rebel more than we have. This is a terrific text: original in its blend of theory and practice; always eminently readable; packed with references, anecdotes and ideas – and bang up to date. 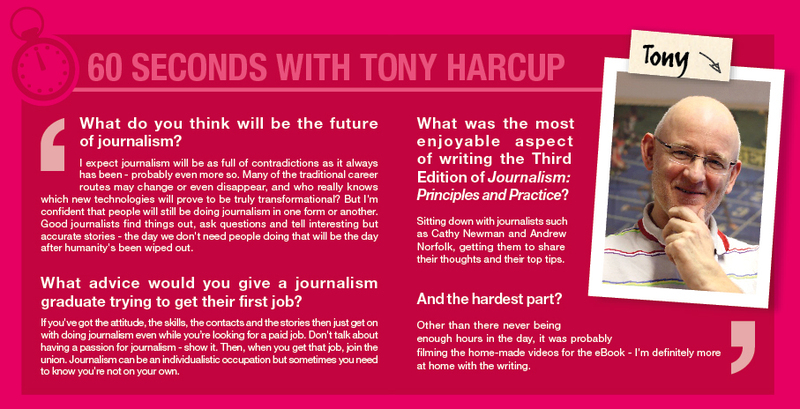 Above all, Tony Harcup conveys throughout his passion for responsible, reflective journalism. A must for all committed to improving the media. Engaging and valuable. This edition presents a thoroughly researched bedrock to teaching key concepts of journalism. Harcup's new offering of set ethical dilemmas is a seminar delight. This new edition reflects how the internet has changed journalism and its landscape. Tony Harcup interlaces practical knowledge and theoretical insight in a user-friendly format to make this an excellent text for all categories of journalists and students. This is simply the best book for journalism students and their teachers that I have ever seen... Just over a decade ago Tony Harcup raised the bar when he used an innovative split-page technique to marry the often conflicting interests of journalism practice and the theoretical and ethical environment in which journalists operate. He has now upped the ante again with the e-book version of the third edition. A very accessible and informative take on a broad range of journalism skills and competencies. Essential reading for journalism students. This is a very useful book that will be of great use for our students. This is a very good book, but not quite what we need. It is a manual for practitioners. We needed something that covers the various theories of media and communications. However, for journalism students, this is the best book by far. It is superbly written and contains no fluff.